First off, I want to explain why I've been a little MIA lately. It's exciting news and a change for our family that's been really great, albeit slightly stressful and busy. I am now working part-time as a design associate for Pottery Barn. As many of you know, I have been doing e-design for about three years and started Ada Avenue Decorating Designs a couple of months ago, which I am still doing along with my new job at Pottery Barn. I have a true passion for interior design and, although I don't have a license (someday! ), this is my dream! Pottery Barn offers complimentary design consultations and they hired me to be one of the designers to offer in-home design services for the Pottery Barn brand. 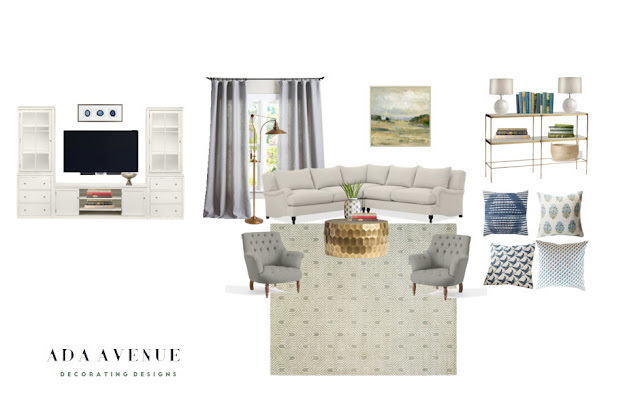 For example, this is one of the preliminary designs that I came up with using mostly Pottery Barn products. I feel grateful to have jobs that I really love that still allows me to have the family life I want. I am mostly working in the evenings and weekends and I was really worried about not spending enough time together as a family, but you know what? It's been great for everyone. David and I have learned to appreciate each other (and our time together) more, my kids are getting more quality, responsible time with their father (which is really important for kids' development) and I am personally benefiting from feeling valued, appreciated and getting out of my element and having adult interaction in a creative way. Anyway, some of my other responsibilities and projects have been put on the back burner for now while we get used to this new life, but I am NOT quitting blogging. I just hope you'll all be patient with me as I figure this out. I have been working on our bathroom remodel in my free time (HA!) and we are almost done so I'll be posting pictures of that soon! Thanks for sticking around, friends. This is wonderful! My dream is to hire you for a room in my house. I have always ADORED your style, creativity and warmth. So happy for you! You're amazing, loves. I just know you'll be in top demand. I can't wait to hear and see all that you do!! Love you! You are so talented i love your work! Happy for you!